Sound "Slightly laid-back" with impressive soundstage placement and lack of grain; bass is there but not overwhelming, which is good news for those with small rooms. Features Tweeter contour control for easier room matching; optional stands make proper placement simple. Use Pay careful attention to detailed instructions for both speakers and stands to ensure maximum enjoyment. Value Terrific match for true budget systems, and surprisingly good in more expensive setups too; a good deal of the performance of higher-priced speakers without the cost. We audiophiles put a premium on having a good pair of loudspeakers. If only the rest of the world were equally enlightened. The first and most obvious reason for this need is that they provide us with quality sound that matches our particular idiosyncratic beliefs of what reproduced music should sound like. Additionally, however, they serve a function that, in some eyes, might be significantly more mundane: as fine furniture. In my mind, if Im going to spend the kind of money that could feed a third-world family for a year on speakers, I should at least be able to impress friends (and women) with their beauty, and maybe even store a trinket or two on them in those moments during which Im not curled up with a snifter of cognac listening to my favorite tunes (or maybe even during those moments -- a big Bath and Body Works candle does wonders to mass-load some cabinets). Some of my favorite speakers are as beautiful to look at as they are to listen to, such as the PSB 1000i in piano black, or the incredibly well-built Nova Audio Bravo. However, there is a drawback. The speaker cabinets on which we store our collections of crystalline animals also have the potential to wreak havoc on the speakers sound, and in the end, isnt quality sound what were really after? Manufacturers spend countless hours tweaking, reinforcing and redesigning their cabinets to provide the least negative interactions with the music coming from the drivers, and the engineering required to produce a good-sounding speaker cabinet can often add both back-breaking weight and wallet-straining cost to a speaker design. Vandersteen Audio has approached this problem from a slightly different direction: what if you just get rid of the traditional cabinet? Other than eliminating a place to rest your collection of Star Wars action figures, what effect will this dramatic move have on the sound of your system? Richard Vandersteen has traditionally been a champion of "boxless" speaker designs, and the 1C is no exception. As viewed from the front, the 1C is a rectangular frame, narrower from the sides than from the front. The only visible frame members are the top and bottom end caps; the rest of the speaker is covered with an acoustically transparent grille cloth, which covers the dowels inside completely. The back of the speaker provides a small panel with banana-plug-only terminals and what Vandersteen calls a "contour control," which adjusts the speakers tweeter level. With this control, you can change the tweeters output by +/- 3dB, to compensate for room irregularities. The 1C is a two-way speaker design. The 1" metal-dome tweeter is a dual-chamber design, with damping designed to provide maximum frequency response while minimizing ringing. The 8" woofer is what Vandersteen describes as a "filled polycone," selected for its high levels of stiffness and neutrality. The woofer is suspended in a cast-metal basket (an unusual choice for a loudspeaker at this price point), and uses a transmission-line port for improved bass response. Both drivers are mounted within small, swept-back baffles designed to eliminate early reflections from the edges. The first-order crossover used in the 1C was designed specifically to avoid distortion of the source materials phase coherence. Additionally, the drivers themselves are laid out in what Vandersteen describes as an "Aligned Dynamic Design," which further preserves the time and phase coherence of the musical source. The Vandersteen 1C has a rated impedance of 6.8 ohms, with an efficiency rating of 90dB. The 1Cs frequency response is given as 38Hz to 22.5kHz. Vandersteen recommends that the 1C be used with an amplifier with power output of 20Wpc to 100Wpc. The 1C carries a suggested retail price of $715 per pair, with the optional adjustable bases adding an additional $85 per pair. Well come back to these in a moment. The Vandersteen 1C speakers were evaluated with my standard reviewing equipment. The only source used was the Parasound CD/P-1000 integrated CD player. The McCormack TLC-1 line stage run in its fully passive mode was used for volume control, sending the signals on to a McCormack DNA-1 power amplifier. Speaker wires used were my only banana-terminated wires, the Kimber 8TC with WBT upgraded bananas and a pair of JPS Labs Ultra Conductors. Connections between the CD/P-1000 and the TLC-1 and between the line stage and the amplifier were handled variously by Cardas MicroTwin, Kimber HERO, and JPS Labs Ultra Conductors, all with RCA termination. All connections were treated with Caig Labs ProGold and XLO TPC wipes. Concrete paving stones from a local building center were placed under the DNA-1 and the Parasound CD player. The Parasound and TLC-1 were, in turn, supported by the Michael Green Designs Justarack, with attractive natural cherry shelves. The CD player and amplifier were connected directly to the AC wall outlets, without benefit of surge suppression or outboard power filtration, though some time preparing for this review was spent with power cords from Essential Sound Products (review pending) rather than stock AC cables. My feline companion Gabby continued in her thankless role as amplifier warmer and chaser of sonic details, while my good friend JP provided a second pair of ears as well as valuable assistance in speaker placement and stand construction. The Vandersteens arrived at my home in a pair of sturdy boxes, with a third box containing the optional stands. Unpacking the speakers went quickly, and was aided by their relatively light weight -- leaving out the bulk of the cabinet greatly reduces the speakers mass and makes them easy to move around. One of the first things that struck me about the Vandersteens was, surprisingly enough, the owners manual. I have never seen such a comprehensive, well-written owners manual for any piece of high-end hardware, let alone a pair of loudspeakers. It includes detailed guides on positioning (with graphs and diagrams), source material, and maintenance. I was quite impressed. The sheet of instructions that came with the stands was equally detailed, though slightly out of date (it refers to the 1B rather than the 1C, but as installation is exactly the same, this is no great crime). Each stand is a well-built metal unit consisting of a "T" shape with additional braces. The stands are hollow, allowing them to be filled with sand. As noted in the instructions, its important to fill them with sand before installing the end cap, as it is difficult to remove the cap once it is in place. The stands arrived with the end caps and sand already in place. Once installed, the stands serve as an integral part of the speakers base, with three adjustable spikes actually contacting the floor. The use of three points is quite ingenious, making the speakers both easier to move with spikes installed, and allowing the owner to adjust easily the speakers vertical orientation from being truly perpendicular to being angled to aim the tweeter directly at the listener. The procedure is, again, described in illustrated detail in the manual. Placing the 1Cs in my listening room was quite simple, especially for a pair of floorstanders. Due to the unfortunate near-cubical layout of my room, I once again fell back upon my favorite speaker placement: firing the loudspeakers diagonally into the room out of one corner, while placing my listening chair in the opposite corner. I adjusted the front two spikes of the stand to angle the speakers just slightly up, so they would fire more directly at my ears. After a few days of fine-tuning, I found the optimal position for soundstage depth and image clarity: I placed the speakers well out of the corner, and roughly five feet apart, with just a slight amount of toe-in. I did experiment with the speakers contour controls. Normally, I find such controls, whether bass and treble on a preamplifier or "sound-shaping" dials on a loudspeaker, to be somewhat frustrating, as they feed my neurotic desire to continuously tweak my system and rob myself of the blissful peace of just sitting down and enjoying music. According to Vandersteen, the contour control adjusts the tweeter level without affecting the performance of the speaker as a whole, particularly in regard to its time and phase coherence. My listening room is configured so that the two walls behind my listening position hold bookshelves filled with paperback and hardcover books, and the walls behind the speakers are bare, a condition which seems to tame the brightness inherent in my plaster walls without completely swallowing all detail. For this room, then, I found that leaving the 1Cs contour controls in the neutral position provided a good level of treble detail without overemphasizing into the domain of graininess. Thus, the majority of my review listening was done with the contour control in the neutral position; however, I think this is a useful addition for those with less control over listening-room dynamics. When my friend JP and I set up the Vandersteen 1Cs in my listening room, I was a little nervous about the review process ahead of me. I had just spent a lot of quality time with the Nova Audio Bravo, which, as you may have been able to discern from my review, I was very fond of. In particular, I was most nervous about my ability to make fair comparisons between the Novas and the Vandersteens, considering that a pair of 1Cs lists for roughly 1/5 of the larger loudspeakers price. In order to help level the playing field, I concentrated on making sure the Vandersteens received as much break-in as possible while I was at work. (Hey, I gotta keep my cat entertained, right?) Before I settled into serious review listening, the Vandersteens were played for nearly 300 hours at moderate volume. The owners manual for the 1C recommends at least 100 hours of break-in, with significant improvements coming over the next 200-300 hours. I have, of late, become a fan of speaker designs that strive to maintain time and phase coherence. My first experience with such designs was with the impressive Ohm Walsh 100 Mk 2, which produced soundstaging and detail far beyond what I expected from a floorstanding speaker of its price. The Vandersteen 1C continued this tradition, albeit in a slightly more realistic fashion. 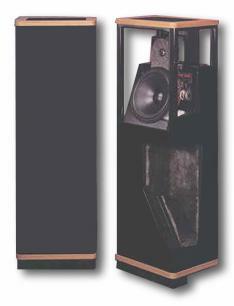 Rather than throwing the gigantic, arc-shaped soundstage of the Ohms, the Vandersteens provided a more rectangular image. Front-to-back depth was excellent, exceeding that of the PSB 1000i and feeling, again, slightly more realistic than that of the Ohms. The smaller Vandersteens even threw the occasional left or right detail further to the sides of the room than the mighty Nova Audio Bravos. One of my favorite albums for testing a systems soundstaging is Lyle Lovetts Joshua Judges Ruth [Curb MCAD-10475]. On "Church," Lovett goes gospel with an up-tempo church choir, complete with driving vocals and broad soundstage, and the Vandersteens did a remarkable job of reproducing this presentation. The positioning of the soloists, including Lovett himself, in front of the rest of the choir was unbeaten by all but the Novas, and the entire choir carried a realistic feel. By comparison, the Ohms and PSBs seemed to squeeze the individual voices together a bit, making them more of a mass sound than a collection of human voices. Instrumental detail was also quite impressive. The Vandersteens did an excellent job of presenting the details and nuances of both acoustic and electronic instruments, particularly for their price. The 1C was significantly freer of grain and harshness than either of my other budget reference loudspeakers, an impressive feat considering its lower cost. Going back to Joshua Judges Ruth, I like to use "North Dakota" both for its simple yet clean instrumentation and the vocals of Lovett and Rickie Lee Jones, when determining the instrumental detail and clarity of a pair of speakers. In this case, the Vandersteens presentation came across with a wealth of instrumental detail, including a clear sense of the Steel guitars decay. Lovetts and Jones voices floated clearly between the two speakers, with more separation than with the Ohms or PSBs, and with less grain than either speaker as well. In fact, I would call the Vandersteen 1C presentation slightly laid-back, though at no time did I get a sense that the speakers were throwing away detail at the expense of smoothness. In comparison to the Novas, however, the 1Cs were somewhat hazy and veiled, particularly from the midrange on up, and their sense of space was no match for the more expensive speakers either. "North Dakota" is also an ideal track for evaluating a speakers bass response, particularly on sharp transients. In several places on the track, a brief kick-drum rim shot takes place, sometimes in combination with cymbals. On the Nova Bravos, this kick drum hits you in the chest, while clearly showing the sharp attack and decay of the rapid strikes of hammer on drum and sticks on cymbals. In comparison, the Vandersteens clearly did not have the low-end muscle to match their larger counterparts, nor did they pull out the minute details of the rest of the rim shot from the overpowering kick-drum strike as well. They did not, however, resort to bloating or chuffing, and managed to still do a reasonable job of presenting the complete picture of the notes. The PSB 1000i preserved significantly more of the occasions bass depth, but also added more unrealistic fatness. This example describes, the Vandersteens bass performance to a T; while rarely as deep and powerful as a larger floorstanders bass, the Vandersteens bass almost never overloaded my tiny listening room. Unlike the Ohms, which often resorted to a sort of bloated bass thrashing, or the Novas, whose deep and powerful bass often simply overpressurized the rear corner of the room, the Vandersteens either delivered tight, tuneful bass or resorted to a facsimile that let you know what was supposed to be there. On many tracks, in fact, the 1Cs were fully capable of providing all the necessary information, such as "Caught A Light Sneeze" from Tori Amos Boys For Pele [Atlantic 82862]. This track delivers a powerful, pounding rhythm track with a series of ringing bells, offset by Amos harpsichord and vocals. At no time during this haunting song did I wish for more bass output than that provided by the Vandersteens, and in fact, I often noted that they lacked the overloading of the PSB 1000i and Nova Audio Bravos. In many ways, the Vandersteens bass response was the easiest of all four loudspeakers to live with in my tiny room -- sufficient for most material, rarely bloated, and capable of demurely approximating truly deep, heavy material rather than chuffing in a pathetic attempt to keep up with the big boys. The only tracks that could consistently cause the 1Cs to go absolutely nuts were "Substitute for Love" and "Ray of Light" on Madonnas Ray of Light album [Warner Bros. 46847]. The deep, rapid techno beats of these tracks were simply too much for the Vandersteens, as they were for the Ohms and PSB 1000is as well. The Nova Bravos gamely tried to keep up, and in a larger room Im certain they would have done an absolutely bang-up job (as would, to a lesser degree, the PSBs), but while they maintained a modicum of tightness, the rooms sense of overpressurization made me feel as though I were on a journey to the bottom of the ocean. From the above, you may think that the Vandersteens were nearly a match for the much more expensive Nova Audio Bravos. This was simply not the case; the Bravos provided more bass depth, more tonal purity and soundstage clarity, and most important of all, a sense of space and "thereness" that the Vandersteens could not approach. However, the Vandersteens were truly impressive with their instrumental placement, relative lack of grain, and sheer musicality. The lack of grain in particularly was what came to mind the most; while not as ear-catching in this regard as the waaaay smooth Bravos, the 1Cs consistently dominated their more expensive budget brethren, particularly the sometimes-spitty PSB 1000i. The Vandersteens 1Cs $715-per-pair price seems almost ridiculously low. If forced to choose between the speakers in my reviewing stable during the time I had the Vandersteen 1Cs on hand, I would pick the Nova Audio Bravos. However, I could live happily with the Vandersteens for music listening; though not quite as fetching a speaker, either sonically or visually, as the PSB 1000i, I think theyd be much easier to live with in the long run, both with their cleaner highs and mids and easy-to-live-with bass reproduction. And while their soundstaging is not as dramatic as that of the Ohm Walsh 100 Mk 2, I think, again, the Vandersteen speakers provided a more realistic and musical soundstaging experience. When you factor in the Vandersteen 1Cs low price, their performance level truly shines. In many ways, they clearly outperformed two other speakers at nearly twice their price, and were not humiliated by the $3300 Novas. If youre looking for speakers in the $500-$1500 price range, you need to hear the 1Cs, if for no other reason than you will be disgusted if you buy something more expensive and later hear how well these little guys do. In fact, no matter what your desired speaker price point, you should seek out and listen to the Vandersteen 1Cs so you can hear how much can be done at a touch over 700 smackers. Be careful, though -- once youve experienced the sound and build quality of the Vandersteens, you may feel that most comparable speakers cost too much. Price: $715 USD per pair; optional stands are $85.